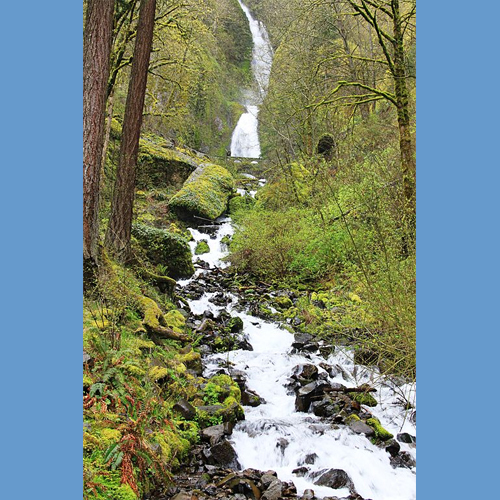 This longer but fairly easy hike is great for those looking to see more waterfalls in the Columbia River Gorge. Family friendly, this 4.8-mile hike has an elevation gain of 1540 ft but is worth every beautiful step. For the most waterfalls on a moderate hike, this loop can't be beat! It encompasses towering Multnomah Falls, rapids and smaller falls of Multnomah Creek, and the tumbling, gradual descent of Wahkeena Creek. A very popular trail; the best time to go is during the spring when the falls are at their best. The loop can be completed in either direction, starting at Wahkeena or Multnomah Falls trailheads. Starting at Multnomah Falls will get you past the crowds first. After a steep climb of nearly a mile and 11 switchbacks on a paved trail, the trail splits, with the paved way continuing out to Multnomah Falls viewpoint. Take a look from the top of the falls, and then continue on the loop by following the Larch Mountain Trail. It turns left at the top of the ridge (where the branch to the top of the falls went right) and immediately crosses a bridge to the west bank of Multnomah Creek. The next 0.8 miles along this trail passes a series of smaller waterfalls. Along the creek, as at other places in the Gorge, you're likely to see water ouzel, bobbing their legs and diving beneath the fast-flowing water. This is a beautiful section of trail. You will come to a signed intersection with the Wahkeena Trail #420, which turns off to the right, leading west towards the Wahkeena Creek basin. Turn right here and continue uphill out of the Multnomah valley. Just don't forget to look around behind you. The view up Multnomah Creek is wonderful; the narrow valley framed by tall firs covered in moss. What a beautiful place! Thank you for sharing! !